EDF EN Canada is moving ahead with its massive $2 billion commitment to build seven wind farms in the province of Quebec and recently completed the 150 MW Massif du Sud and 150 MW Lac Alfred Phase One wind projects toward that goal. Renowned for its production and export of massive quantities of hydro power, the Canadian province of Quebec has now taken a major leap forward in the production of wind energy with the recent commissioning of the 150 megawatt (MW) Massif du Sud and 150 MW Lac Alfred Phase One wind projects. The two projects cost $700 million and are part of an overall $2 billion commitment that EDF EN Canada has made to build seven wind farms to supply government-owned utility Hydro-Quebec. They add to the 80 MW Saint-Robert-Bellarmin project, which was completed in October 2012. The company is a subsidiary of French multinational EDF Energies Nouvelles. EDF EN Canada won a tendering process offered by Hydro Quebec for its seven wind power projects in 2008 and 2010. 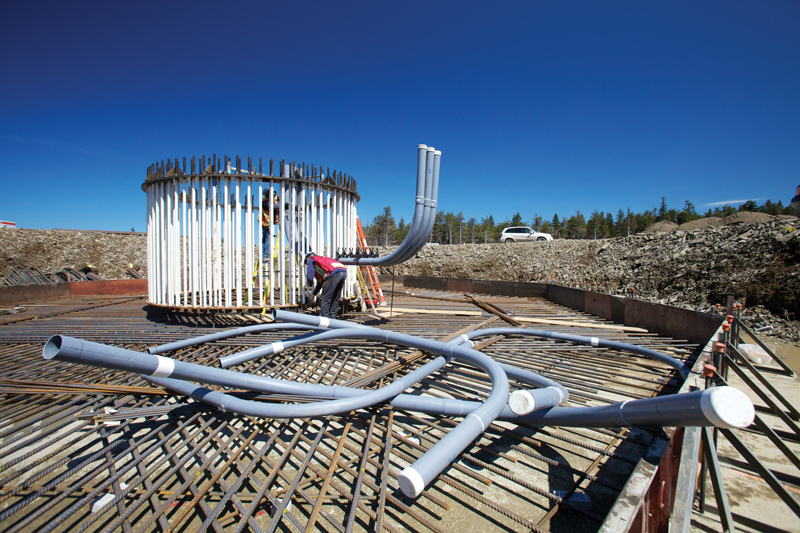 Each project is tied to a 20-year power purchase agreement. They are part of the province of Quebec's overall goal of producing 4,000 MWs of power from wind energy by 2015. EDF EN Canada's seven projects will contribute just over 1,000 MWs to that total. "Within Canada, Quebec is quite highly ranked from a wind resource perspective," says Benoit Rigal, EDF EN Canada vice-president of engineering and construction. "Quebec has a very good wind resource in the very north of the province and along the Saint Lawrence River because the river plays a corridor effect role on the wind," says Rigal. Quebec is indeed a leader in building wind energy projects within Canada. At the end of 2012, the province had 1,684 MW of wind power capacity and possessed the largest wind farm in Canada. The Massif du Sud project is located about an hour south of Quebec City, and the Lac Alfred Phase One project is about 250 miles northwest of Quebec City. Phase two of the Lac Alfred project, which will bring another 150 MWs of wind power on line, was slated for completion by September. Both the Massif du Sud and Lac Alfred Phase One projects consist of 75 cold climate versions of Repower Systems' MM82 and MM92 wind turbines. They are the largest projects in the world where REpower Systems has put its cold climate turbines into service. Both the Massif du Sud and Lac Alfred projects have been described as "complex" for a variety of reasons. Rigal says that from a geographical standpoint, what made the projects complicated was the hilly terrain where they are located. Also, in the case of the Massif du Sud project, part of the wind farm is located in a regional recreational park. He says there were several environmental hurdles that project designers had to overcome, and it made project coordination "extremely challenging". "It was complex because we had to situate the project within a regional park, meaning a recreational area where there are land users such as snowmobilers, horseback riders, mountain bikers, and hikers using trails," says Rigal. "Also there was a sensitive bird species called the Bicknell thrush, and we had a lot of small rivers and streams to consider." Weather conditions during construction were also challenging, with a considerable amount of activity taking place in winter. Construction on the Lac Alfred Phase One project began in June 2011 and in November on the Massif du Sud project. Both were completed in December 2012 and put into commercial operation in January 2013. "We went through almost two winters," says Rigal. "Finalization of erection, mechanical completion, and commissioning of the wind turbines was completed during very heavy snow storms and icing events." Construction was required through the winter months because of the permitting process and the company working hard to meet its delivery deadline with Hydro Quebec. On the remaining projects, EDF EN Canada hopes to avoid working in winter as much as possible. "We've learned a lot," says Rigal. "We know what to do and what not to do and how to mitigate this risk." The projects were completed safely without any major accident having occurred during construction. All seven of the company's project sites were selected by EDF EN Canada and provided to Hydro Quebec as part of the tendering process. They had to fit within Hydro Quebec's criteria for acceptable locations, which include overall cost, the grid connection cost, and feasibility, local acceptance, and the level of local content. Rigal says that from EDF EN Canada's perspective, the company uses similar criteria when selecting potential sites, with a focus on the quality of the wind resource. The Massif du Sud and Lac Alfred Phase One wind projects are part of the province of Quebec's overall goal of producing 4,000 MWs of power from wind energy by 2015. EDF EN Canada's seven projects will contribute just over 1,000 MWs to that total. As the company was going through the process of site selection, Rigal added that he was "very pleased" with the level of local support for the projects. Enbridge Inc. owns a 50 percent stake in both the Massif du Sud and Lac Alfred projects. They are contributing to the company's 'Neutral Footprint' commitment to generate a kilowatt of renewable energy for every kilowatt of conventional electricity that its operations consume. Enbridge has also partnered with EDF EN Canada on a project south of Calgary, Alberta, called Blackspring Ridge—a 300 MW wind project that is the largest in the province with an estimated cost of about $600 million. "These turbines have been designed for the humid Canadian weather with heavy temperature fluctuations and have already proven themselves in test projects in Quebec," says Matthias Schubert, chief technology officer at REpower Systems AG. Each wind turbine is placed at a height of 80 meters and is rated for a power output of two MW. Rigal says that the towers used on these cold climate wind turbines are fabricated from higher grade steel. Additionally, oil-based lubricants used in the turbines are able to function at lower temperatures, and heating systems are larger than on standard turbines. 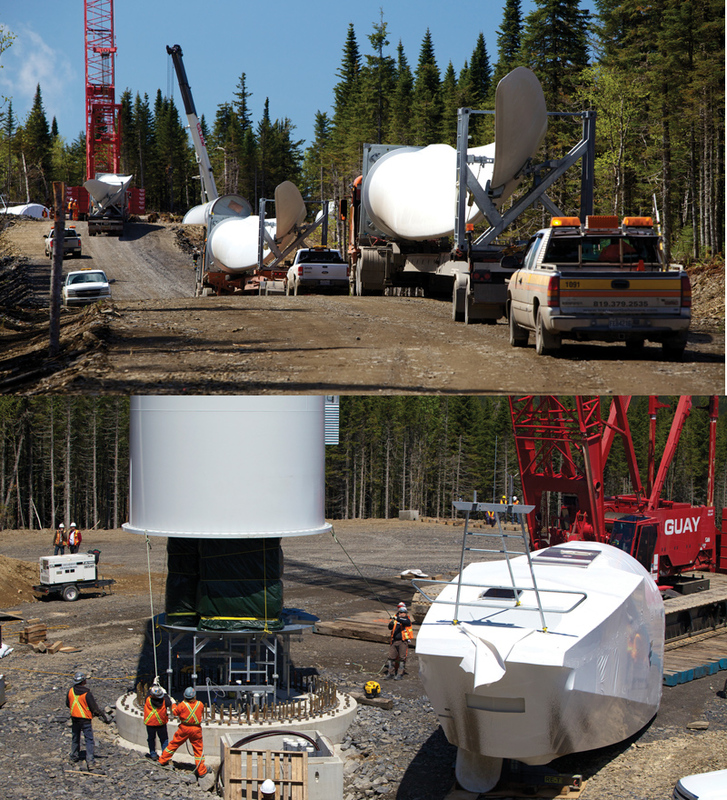 REpower Systems has a framework agreement with EDF EN Canada to provide turbines for all seven wind projects in Quebec. REpower Systems used three equipment suppliers to meet its local content obligations on the Massif du Sud and Lac Alfred Phase One projects. Marmen supplied the towers, LM Wind Power provided the blades, and SEG Woodword supplied the converters. REpower Systems supplied the nacelles and hubs. All the blades, towers, and converters were manufactured within the Gaspésie region of Quebec. Andreas Nauen, chief executive officer of REpower Systems AG says that the Lac Alfred project is the largest project the company has supplied to date. "We want to carry out many more projects in Canada, and this is a market in which we can make the most of the advantages of our technology," he says. The projects had a significant economic impact on the local communities where they are located and have contributed to building capacity within the province of Quebec to supply and implement large scale wind energy projects. It has in particular boosted economic growth in the Gaspésie region of the province, which was in need of more local development. 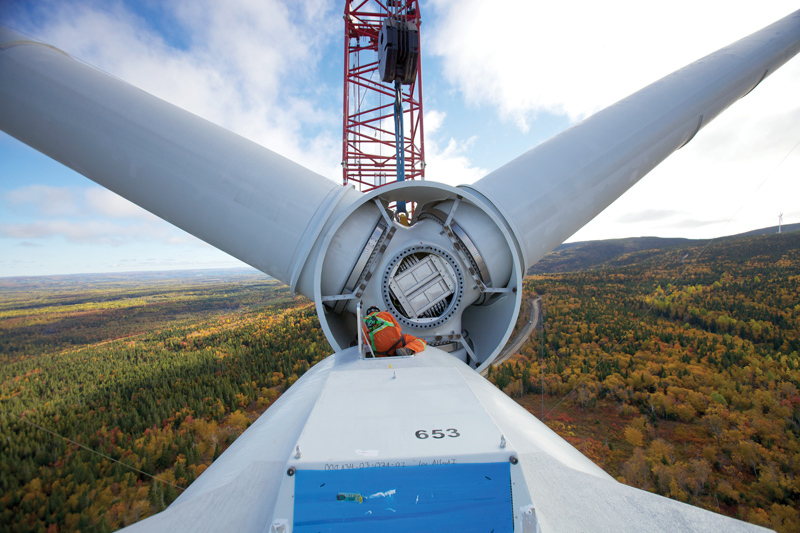 wind energy industry and 1,200 manufacturing jobs in the Gaspésie and Bas-Saint-Laurent areas. 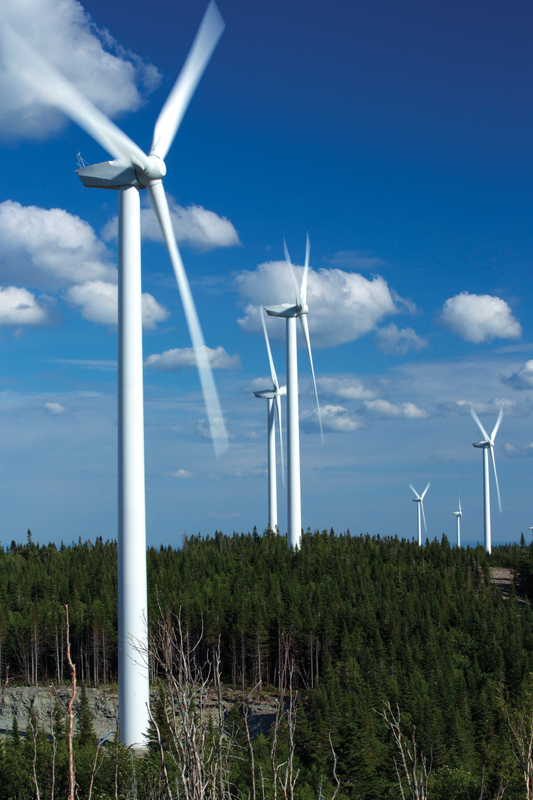 Gaspésie-based companies like the Ohmega Group have also experienced considerable growth through its involvement in these wind energy projects. Rigal says it is now a North American leader in providing supervisory control and data acquisition (SCADA) products and services. Another Quebec-based company called Technostrobe, which provides obstruction lighting products to wind farms, has also benefitted from its involvement in development of the local wind industry. Both the Massif du Sud and Lac Alfred Phase One projects provided 600 construction jobs at their peak, and they will provide between 20 and 30 additional permanent operations and maintenance jobs. Each will also supply enough power to meet the needs of 35,000 homes annually. CER, which is a joint venture of three Quebec-based companies, was the main construction contractor on the Massif du Sud project and Borea was the construction contractor on the Lac Alfred Phase One project. Borea also constructed the Saint-Robert-Bellarmin project. By agreeing to permit the construction of these wind farms, the municipalities where the installations are located will receive an annual contribution of $600,000 during the 20-year power supply agreement with Hydro Quebec. The corporation managing the Massif du Sud regional park where part of the Massif du Sud wind farm is located will receive an annual contribution of $75,000, which Rigal says will help park management develop other recreational activities. EDF EN Canada's sister company, EDF Renewable Services, will operate and maintain the projects. Of the remaining four projects to be built by EDF EN Canada as part of its commitment to Hydro Quebec, two are partnerships with local municipalities, which have taken a 30 percent ownership stake in the projects, and two are owned entirely by EDF EN Canada. The company had been sole owner of the now completed Saint-Robert-Bellarmin project. But in July, Enbridge and EDF EN Canada announced an agreement which saw Enbridge acquiring a 50 percent interest in that project.